Published on February 9, 2015 in General T&T and Schools. 2 Comments Tags: Hillview College, Stephen Kangal. And it came to pass that when Sir Hubert Rance was Governor of T&T and Elizabeth II was Queen of the British Commonwealth having ascended the British Throne three years before Hillview in 1952 after the demise of her father King George VI and T&T still flew the Union Jack, sang Gave Save The Queen and was still a colony of Britain that ruled the seas and founded the British Empire upon which the sun never did set. The Honourable Roy Joseph was then Minister of Education being an elected member of the Legislative Council that sat in the Red House. Dr Eric Williams had just started his political education of his people as a pretext and forerunner to power acquisition by the emerging nationalist movement. The availability of much-needed secondary school places was taxing on those parents living outside of the towns of POS and San Fernando and to a lesser extent of Chaguanas. The Elders of the Aramalaya Church started to lobby The Presbyterian Church when J.C Mc Donald was Moderator of the Presbyterian Church in 1951 for the establishment of a Boys School in the North after SAGHS was established in 1950 at Austin Street in St. Augustine to educate our sisters. The late Rev E.T.Lute then Principal of Naparima College initiated The Five Year Development. Minister The Honourabe Roy Joseph of San Fernando- a great friend of the Presbyterian legacy and tradition. Behold there was born on 17 January 1955 @ 8:30 a.m. at Sherrif Street in Tunapuna in a lowly, makeshift cow-pen aka a manger a child called Naparima College, Tunapuna Branch named after his paternity in San Fernando, a savior to the pioneering 44 in Class of 1955 and now to more than thousands of young people of East and Central Trinidad and counting. That baby was clad in swaddling blue and khaki. The future shining Eastern Star led three wise men/shepherds of young men named Swann, Alisharan and Mohammed to the place of this lowly unsung, uninspiring externally and unheralded quiet birth. These three shepherds brought their gifts -not of gold frankinense and myrrh-but of dedication, commitment and love of and belief in young people. From classrooms year by year. Listeners of Radio Heritage 101.7 The official Radio Station of the 60th Anniversary Celebrations of Hillview College and doing yeoman service with its several live and recorded re-broadcasts of the events of the 60th Anniversary Celebrations of Hillview College. A most pleasant Good Morning as we embark via Live Radio Heritage broadcast of the third event on occasion of the Diamond Jubilee Celebrations of our Alma Mater-Hillview College. That secular litany that I recited, my friends is what I found enclosed in a time capsule of events that predated Hillview. It is this that I would term the ecology and Aramalaya Chapter that culminated in the auspicious birth of Hillview College. Hillview has since blossomed unto and taken over the National Stage with a bang, with pyrotechnics, seismic vibrations and CAPE Tectonics- the shifting of the performance plates witnessed by and praised last year by our Minister of Education, Dr. Tim Gopeesingh last year. He will do that again today I am sure and transmitted live and alive. Last Saturday at the Aramalaya Thanksgiving Service I described the important role that the Aramalaya Church played in the realization of the birth of Hillview College. I recited the history of Hillview to 1957. Hillview later on in that year made both the qualitative and quantitative leap to relocate to this idyllic, serene, mind- motivating and green, piedmont site at El Dorado Road pointing to the futuristic gold and diamond achievements of the occupants. I will urge students to listen in to the broadcast carried by Radio Heritage because you can then get a holistic comprehensive and composite picture of Hillview’s history. Thank you students and staff for finally agreeing to undertake the planned pilgrimage from here to the place of our birth in Sherrif Street later this morning. There on Saturday 17 we dedicated a plaque to the founding of Hillview in 1955. That ceremony has transformed and sanctified that site into a shrine and sanctuary as a permanent reminder of where we came from and to chart the future course of Hillview’s New Republicanism for where we want to be. That is why our journey later is not a march. It is a pilgrimage. It is going back to roots-re-connecting with the groundswell- the magnetic sub-terranean force that has been driving Hillview to achieve greater heights. Yesterday was a most transfiguring experience with a large contingent of the boys of 1955 gracing the solemn occasion. The Moderator brought a most inspiring and relevant message. The service was awesome- inspiring giving God the glory for Hillview. The Aramalaya Chapter in the ground-breaking saga of Hillview is now fittingly documented and consecrated at the place of its birth. My only regret is the not enough students were present to witness and savour that moment of history. But the message will soon take hold of you and motivate you to belong to Hillview. The first Graduation ceremony of Naparima College, Tunapuna Branch was held on 24 March 1960 in this building. Work began on this site in 1956 with the first Canadian pre-fabricated building being established as this Main Building. When we occupied this building the terrazzo floor was still wet. Mr Stephen Alisharan and Effle Mohammed had made us previously made us the students walk from Sherrif Street in the hot sun in early 1957 to collect the stones one by one to make the ground safer for sports. The first vision of this site in 1957 opened up in us futuristic visions, renewed ambitions and new dreams for successfully mounting the challenge against urban monopoly in secondary education. Today that challenge is fully accomplished and locus of attention has shifted to urban Trinidad. By then more staff had been recruited. The Classrooms were then built with the Science Block. Students then began to explore the prospects of venturing on the hills to the north with many stories to tell including the infamous guava hole and the abandoned Caura Dam. The first principal was Rev Harod F Swann, followed by Stephen Alisharan and Russel Alcorn and then Rev. Kirkatrick in a resumed term. One of the original members of the 1955 Staff who was elevated to the Principal-ship, Mr Stephen Alisharan stayed with us until 1975 when Mr. Stephen Seepersad took over followed by Mr. Disciplanarian- Mr.Richard Kokeram who came from Iere High School. Then came Mr Jeremiah Seepersad and the present incumbent Mr. Leslie Mahase. All heroes of war fighting against illiteracy and mediocrity and placing Hillview in its rightful place. 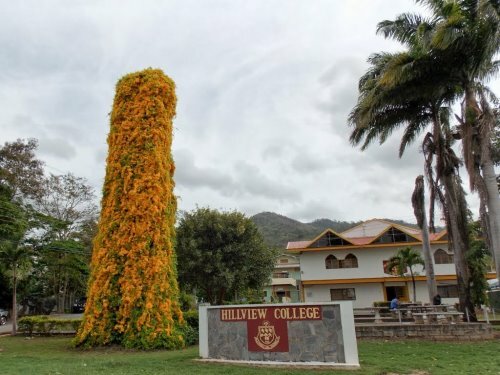 Any discerning mind observing the dynamics and the ambience that prevailed amongst the students would surely have come to the conclusion that Hillview had a divine destiny- to decolonize the prevailing unfair secondary education paradigm. That was a centre-periphery imbalance at the annual island scholarship awards list to the disadvantage of the rural dispossessed. The only Gov’t school located outside of POS was St. George’s College in Barataria. Rich veins of rough diamonds lay embedded in the earth of the East waiting to be unearthed, cut and polished to play its part in the widespread development of the rural fringes and south of the Caron River. Then came Hillview and SAGHS and the rest is a history- one that is more palatable- more just and equitable- real scope for social and economic mobility and tertiary education. Some semblance of the equality of educational opportunity was achieved. Today another phase in the physical expansion of Hillview will be initiated by the Minister of Education to make the impeccable Hillview Brand more accessible to quality students from more 36 schools. We thank the Government for recognizing the value and volume of the education offered at Hillview. It is indicative that monies spent by Government at Hillview is real value for money and well utilized. 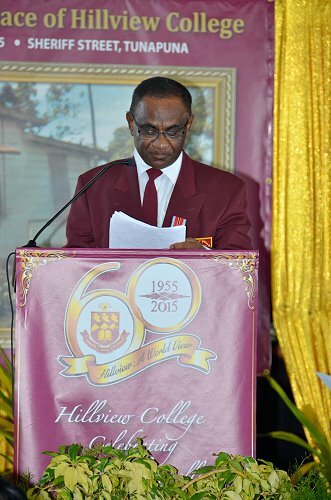 I extend to the Administrative Committee, The Principals past and present, the members of the Staff, the students, The PTA, The HOBA and indeed the Synod of the Presbyterian Church warmest greetings and congratulations on the happy and special occasion of the attainment of the Diamond Jubilee Celebrations of my alma Mater- Hillview College. I also send warm greetings and felicitations via the air-waves of Radio Heritage to our sister school, Iere High School on the occasion of their 60th Anniversary and birthday today. Iere began on the same day in Siparia as Hillview in 1955 with Rev Weldon Grant as the first Principal and Rev Harold Swann as our Principal. The former Chief Justice Mr. Justice Sat Sharma, member of the pioneering class of 1955 who is unable to be here today sends his best wishes for the occasion to all concerned. I will also like to pay tribute to the late President of the Republic of T&T, Mr. Justice Noor M. Hassanali for the overseeing role he played during the construction stage of the College at the El Dorado site visiting it every Sunday morning with Mrs. Hassanali until the Main Building was completed by September 1957. He was also a member of the 1954 appointed Secondary School Expansion Committee. this reads like something out of Santa Claus and Jesus Christ. The fact is that the English elite taught the west indians slaves and indentured laborers how to read from an English perspective. The humble birth-place of Hillview College is synonymous with the cow-pen in which the Christ-child was born. That is why I have called the birth of Hillview the Nativity of Hillview and used the Biblical format to describe the emergence of Hillview in January 1955. For many of us Hillview meant a new birth and a change from the hewers of wood and drawers of water to a new janaam or opportunity for mobility and social upliftment. I was exposed to 22 years of English Colonialism that could not erase 6,000 years of Indus Valley cultural conditioning transmitted genetically via my indentured parents.